Labour leader Brendan Howlin and the Galway Advertiser's Charlie McBride. 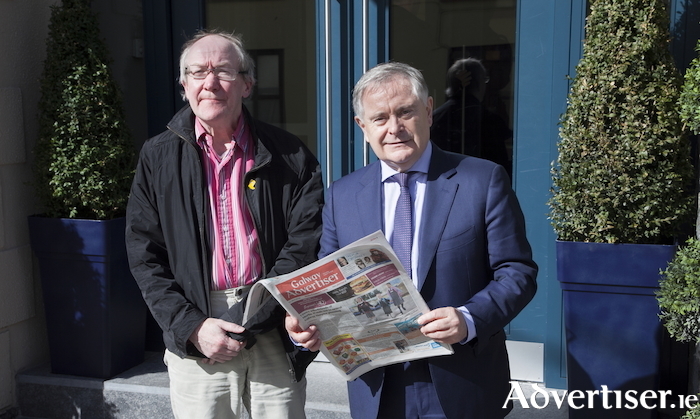 Labour Party leader Brendan Howlin made a whistle-stop visit to Galway last week, during which he sat with the Galway Advertiser and candidly reflected on Labour’s recent electoral travails while looking forward to restoring the party’s fortunes. My last two interviews with party leaders – Leo Varadkar and Mary Lou McDonald - took place against the backdrops of gray and rainy days but Howlin brought bright Wexford sunshine along with him; a possible good omen for Labour’s future prospects he suggested light-heartedly. In Ireland, Labour has lost ground in recent years to the likes of Sinn Féin and People Before Profit. “The left is a more crowded space now,” Howlin says. “There are people of the left in Sinn Féin but I don’t regard it as a left party. It is a populist party that will do what is necessary politically for its own advancement – that has been its tradition in Northern Ireland. In terms of some of the shrill voices of the extreme left, there is a significant difference between voices of protest and parties that want to roll up their sleeves and make a difference. Howlin outlines some of the policies Labour will put before voters at the next election: “After a decade of austerity we now need to invest in public services. So we are opposed to tax cuts. The Government is proposing to give the 19 per cent of tax payers who pay the highest rate about €5 per week back. Is that the most useful thing we can do with tax resources? We say not. We want to invest in public services and we have clear plans to do that. Labour’s last experience of coalition was far from happy. Howlin acknowledges this and shares his thoughts on how he would approach the prospect in the future. “We were certainly scarred by the electoral results that followed our last participation in government," he says. "We have to be honest with ourselves. The people who normally vote for us have fallen out with us and we need to reconnect with them. Since becoming leader in 2016 I’ve been talking to trade unionists, community organisations, and others who felt let down by some of the things we did in government. We have to explain that we went into government in the worst of times yet did our best to defend public services and get people back to work. "We do have positives to point to regarding things we achieved, like resisting Fine Gael’s agenda of privatisation. If we go into government again, we must ensure there is a clear Labour voice that is distinctive from the government voice. Last time we allowed the government voice to be the only voice, and we kept some ferocious battles quiet because we did not want to destabilise the economy. We paid a price for that so we have to have a clear Labour voice on every issue next time and a clear Labour red line that if it is not adhered to, we will not participate or support the government." Recently a number of Labour councillors have publicly voiced their dissatisfaction with Howlin’s leadership and Alan Kelly has been mooted as an alternative leader. Is Howlin’s position secure? “We all want the Labour Party to succeed,” he states. “None of us are thrilled that our support is at about six per cent in the opinion polls. We want to do better and people have different views about how to achieve that. We’re going to have a very open discussion on these matters over the coming weekend and I believe we will emerge stronger from that. I don’t think there is any scope for internal division because that would only diminish our relevance further. I disagree with the notion that simply changing the leader is transformative. Page generated in 0.0947 seconds.